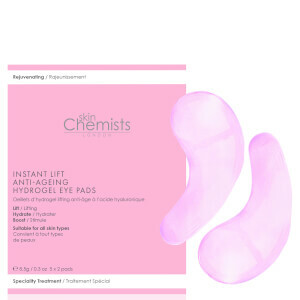 Zap tired, eyes back to life with the skinChemists Lifting Hyaluronic Anti-Ageing Hydrogel Eye Pads; five pairs of invigorating hydrogel eye masks that deliver an intensified treatment to help lift and firm ageing, sagging skin surrounding the delicate eye area. Saturated with a concentrated serum, the soft eye pads help to drive Hyaluronic Acid into skin, replenishing and locking in moisture for long-lasting hydration. Carrageenan obtained from Red Algae helps to bind water to skin for intense moisturisation, whilst Alpha-Glucan Oligosaccharide helps to balance skin’s microflora and minimises the appearance of lines and wrinkles. Skin around eyes appear tauter, firmer and miles younger in just 10-15 minutes. 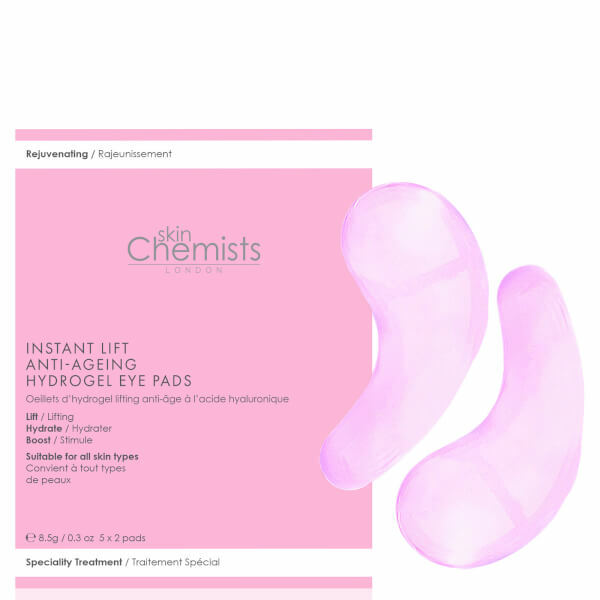 Apply each hydrogel pad to the underside of each eye. Leave for 10-15 minutes. Remove and gently massage in any residue. Do not re-use the pads. Use weekly. Caution: Discontinue use if redness occurs. Avoid direct contact with the eyes. Do not ingest. It is recommended to carry out a patch test before application. Aqua, Glycerin, Propylene Glycol, Carrageenan, Phenoxyethanol, Biosaccharide Gum-4, Ethylhexylglycerin, Panthenol, Hydrolyzed Pearl, Sea Salt, Synthetic Fluorphlogopite, Alpha-Glucan Oligosaccharide, Algin, Silica, Propanediol, CI 77891, CI 77861.